​I love teaching students how to play the harp! The harp is a beautiful, fascinating, and rewarding instrument to play. Beginning students usually enjoy even the earliest learning stages; after all it is pretty difficult to make a a harp sound bad! 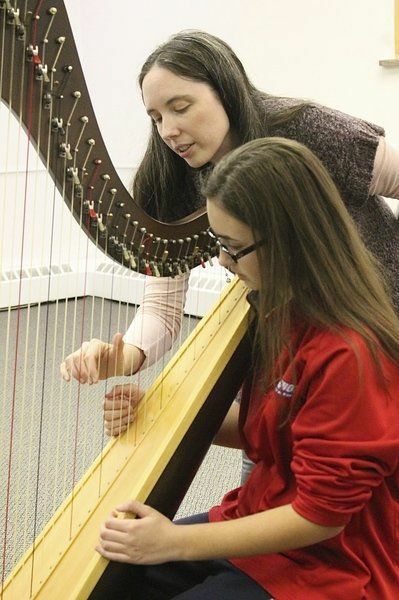 Students are welcome to participate in private harp lessons, harp ensemble, and group class. I am accepting new students at my studio in Spartanburg, SC as well as online via video conferencing such as Skype or FaceTime. There is nothing difficult - only new things, unaccustomed things. It is never too soon or too late to learn to play an instrument you love. When I teach, the goal is not for my students to win competitions or become professional musicians (though some students do). My goal is to help students become noble people, with compassionate hearts and disciplined minds, who love music. I am a registered Suzuki harp teacher, and I draw from many teaching philosophies to find the best approach for each student. All students study standard harp repertoire, music theory, note reading, and musicianship in their individual lessons. I have been teaching both pedal and lever harp to students of all ages since 1998. My students range in age from the very young, to the young at heart. I understand that everyone learns differently and at their own pace. Before relocating to the Carolinas, Kela established the harp program at Buffalo Suzuki Strings in New York, where she taught individual and group harp lessons as well as Suzuki Early Childhood Education classes. Kela was also privileged to serve as harp faculty member previously in Texas at Temple College, Round Rock ISD, the University of Houston Moores School of Music Preparatory and Continuing Studies Program, Longhorn Music Camp, and Blue Lake Fine Arts Camp in Michigan. In teaching the harp, I pass on the knowledge given to me by many wonderful harpists including: Nancy Hurrell, Gayle Barrington, and Paula Page. I was also honored to briefly study with one of Salzedo's famous pupils, Alice Chalifoux. My experiences as a very young Suzuki piano student with Joan Gregory, and later my trailing as an adult with Suzuki harp teacher trainer Delaine Leonard, gave me the experience and skills to nurture the development of very young musicians. All of these amazing women inspired my love of teaching, and I owe my pedagogy knowledge to them. Many of my students go on to study at some of the best colleges and universities in the nation. Former students have received or are currently pursing academic degrees at: Dartmouth, Southwestern University, the Catholic University of America, Texas A&M University, and the University of Texas at Austin. A few of my harp studio alumni have gone on to pursue music as a career majoring in: Music Education at Baylor University, Music Therapy at Sam Houston State University, and Harp Performance at the University of North Texas and Indiana University. ​Some students choose to participate in solo competitions at the regional, state, and national level. Kela's students have been finalists in the Houston Symphony League Concerto Competition, prize winners in the Midwest Harp Festival Competition, and have won positions in the Texas Music Educators Association All-State Bands and Orchestras.